Anna Jones of Dyer Boats in Warren, Rhode Island. Joins us part time and is very passionate about needle point and has a great eye for color. In her spare time, she loves to stitch and helps with the breeder of her Portuguese water dog, Deedee, and is wonderful addition to our shop. Barbara Platt is retired from her long career at Rhode Island Hospital Trust and has been with us for 21 years. 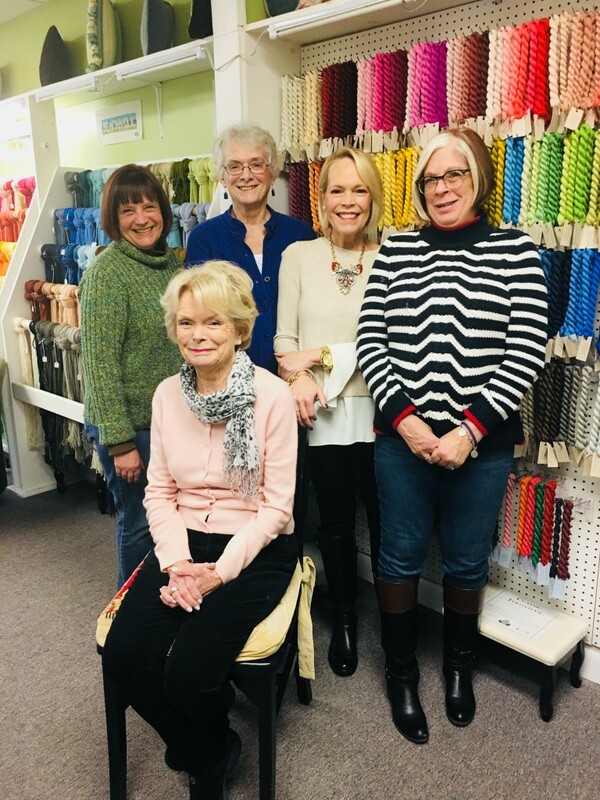 Barbara is a talented needle pointer and all our customer love her and Barbara makes the shop a fun place to be. We are very fortunate to have her. Betsey Harrison is our social media expert and loves keeping all our customers up to date on what’s new in the needle point business. She keeps the shop looking great and displays all the merchandise beautifully. Our customers enjoy seeing Betsey when they come to shop. Stacy Antignano is a stay at home mother and has raised three children and takes care of her grandchildren. In her spare time, she loves her needlepoint and is an excellent stitcher. Stacy has joined our staff to teach in our workshops. 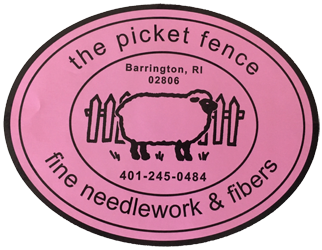 Stacy is very knowledgeable in the needle point business and is an excellent teacher. Linda Harrison, the wonderful owner of the shop! Linda has owned the shop for 40 years and is so passionate about the business. Her eye for color is magnificent and her knowledge of the needle point business is amazing. Linda has customers all over near and far that continue to send her their business. She is delightful to work with and her customers trust her with all their needle point needs. Stop in and meet Linda, you will enjoy meeting her. Rex Harrison is the mascot of The Picket Fence! 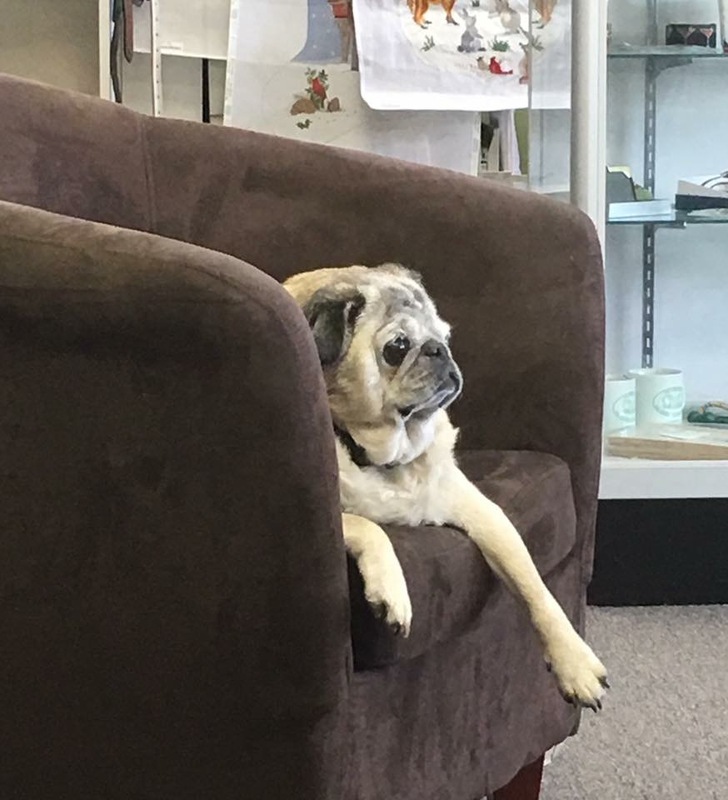 He has been with the shop for 14 years and our customers love to see him when they come in. He is so handsome and loves when other dogs come to visit! Bring your dog when you come in. Treats and all.